Objective: Match and create charming bubble combos in this new colorful puzzle arcade game! Change the color of the bubble when you think it doesn't go in one place and get the highest score! 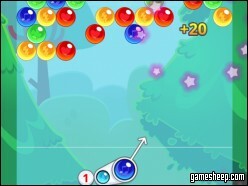 We are glad that you have chosen to play Bubble Charms on GameSheep.com, the most dynamic website available. If you like this game Bubble Charms don't forget to rate it and this way you will help with selecting only the best games for the home page.